How exciting, my first Author Spotlight and its the lovely Author Lauren K. Pomeroy! 1. Where do you call home? Apache Junction, Arizona - We're about a 15 minute walk from the great Superstition Mountains, technically it's my parents home, but it’s the one I grew up in, and the one I would always love to return to. 2. What is the title of your most recent book? "Alexander: Sacrifice. Instinct. Rebirth." 4. Plans for a next book? Is this part of a Series? This novel was originally going to be a series trilogy until I decided it needed to be a three part novel, rather than a separation of books. Also, however, there is an untold story of the great "Valentin Marcel" through tiny excerpts in the novel, an untold history of the great battle between werewolves and the "nightwalkers" otherwise known as vampires - Valentin Marcel is the father of the main character, Alexander, in "Alexander: Sacrifice. Instinct. Rebirth." who ends up tragically dying in the beginning of the novel, and is a great impact on Alexander's entire life. "Valentin Marcel: Dawn of the Nightwalkers" is the prequel to Alexander's story that does not yet have a publication date, and is still the process of being a detailed written outline. 6. Who's your favorite author? There is honestly so many, however I love Christopher Paolini, and old stories I love are renditions of Disney fairytales retold - I enjoyed "Confessions of an Ugly Stepsister" along with "Wicked," however my favorite Disney story is that of Beauty and the Beast, which I read "Beauty" by Robin McKinley and loved it all over again. 7. Your favorite book? "Beauty" by Robin McKinley, and "Mordred" by Vivian Van Velde, of course along with the Eragon Series. 8. What book are you currently reading? Bram Stokers "Dracula"
9. A book you would recommend? Mine of course! hahaha, just kidding! (Not really) lol. I do have a couple people reading my books that I have given for free as a Kindle Gift, and so far many think that my book is very interesting, and worth the read. A book I would recommend outside of my own would have to be...Mary Shelley's Frankenstein, or Cold Mountain (one of my favorite love stories). 10. How do you pick your books? I pick them normally based on popularity or person interest. For example, I would pick novels like The Hunger Games, The Inheritance Eragon Series, or novels with that kind of popularity and the reviews on Amazon. Recently, I was going to pick a novel called "Fifty Shades of Gray" however read the reviews and there are MANY who didn't like the novel because it was too disturbing in an odd sexual tone, so I decided against it. Reviews definitely help you get a personal insight before purchasing. Novels of personal interest would be my own appreciation of the Disney tales, which is why I chose Beauty by Robin McKinley, and I have "The Frog Prince: A Tale for Consenting Adults" which is another novel based off the Frog Prince tale. 11. Advice for other authors? Don't be afraid to just go for it. In the end, especially if you're self published and you're worried about publishing your novel, once it's gone through editing, any name changes that need to take place, and a cover design you like, what else do you have to lose? No one is guaranteed fame, and I know it will be difficult if you don't achieve your dreams, however you'll never know if you don't take the leap and go for it. 12. Do you write under a pen name? No - I'm a very responsive author, and even if I become famous, I still want to be that way; Interactive with my fans on Facebook, Twitter, and so on. I think many lose their personality when getting such a huge fan base, but that doesn't mean you need to take yourself out of your work because you're "too famous". 13. Where do you write? At my apartment in Gilbert, AZ, normally on my bed, super late at night around 3:00am, or in my very crowded office at my desk. 14. What do you wear when you write? I usually prefer jeans and a t shirt if I'm writing in the day, but of course late at night, I write in my pajamas. 15. Do you have a pet (s)? I do - I have a Dalmatian named Lucy, and she is my best friend. You can view her pictures on Instagram, all the links to my sites and where to follow me will be provided below. 17. If you were deserted on an island, who are 3 famous people you would want with you?Johnny Depp, Mel Gibson, and Nicole Kidman. 18. Of your characters, which one would you say is most like you and why? In "Alexander" I really enjoy the sub-character, Constantine, who is the right hand of Alexander, and his lovers brother. He's meant to be a very complicated, strong, bold-faced character and he's by far one of my favorites. 19. What made you want to be a writer? Well, I started writing when I was 11 years old and during that time I knew that’s what I wanted to do was to create stories. I didn't really know why, however from the time of being 11 to 13 years old, I wrote my first book called "Eatheon" which remains unpublished to this day, however it consisted of large ideas, and 250 pages written down on lined loose leaf paper, now on my computer. It was because of films like Braveheart and Gladiator, with great stories such as that, which made me want to create stories with the same impact. 22. What is the one thing you never go without? Pens and a small pad in case I think of story ideas on the go, along with my film score soundtrack playlist on my Iphone. 23. Your biggest influence? Walt Disney and Braveheart - I think the creative genius between the two, both producers, and directors, each giving the world great stories, it's hard to not be in love with either. 24. Favorite TV show? I Love Lucy and That 70's Show. 25. A great blog you would like to recommend for others to discover? This one of course!!! It's always fun to see the blog of another writer, alike myself. Lauren is also in the works of a book called Memoirs of a Sleep Talker. Her ispiration (hunky boyfriend- there are pics!) is a riot when he sleeps and the things he says during his slumber ! I alas am a boring sleeper, but if you've got a funny story, guess what! Lauren wants to hear it! Go here. Would you like to get her autograph on your kindle copy?! You can with Kindlegraph! Click here to request one from this lovely lady! Thank you so much Lauren for participating in my Author Spotlight, It was really fun getting to know you more! I recomend Lauren's book to all and I send her the best of luck along with a big slice of cheesecake! Yum! P.S. If you would like to get Spotlighted, click link above that says "Author- spotlight" and have fun. Appreciate it! Fun interview. Will have to put her book on my TBR pile. Thanks for dropping by! 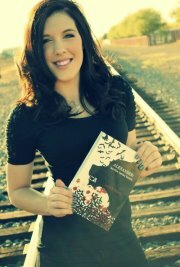 Go to Lauren's blog,she is still offering four free Kindle copies of her book! Happy reading!